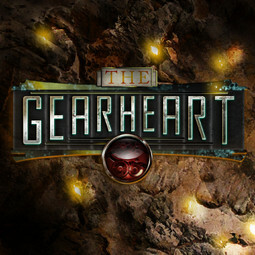 Journey back the universe of The Gearheart. 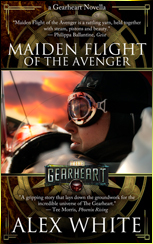 In this prequel novella, agents Augustus Elsworth and Isabelle Carriker battle wise guys, betrayal, nefarious powers on high and each other, while attempting to unlock the secrets of Augustus’ mentor and harness the full potential of a hybrid mechano-alchemic engine before its power is unleashed on an unsuspecting world. Just so you know, I hadn’t intended for this to become the Alex White month of reviews, it just worked out that way. We get to see Augustus in a completely different light in this story. In The Gearheart, he was much a follower. In this tale, he is a rebel; loud, cantankerous and proud, not at all the shy and retiring Elsworth we were used to. And while this tale is clearly about the mechanic, we also get to see another side of Isabelle; one where she isn’t defined by her relationship to Jonathan. I stumbled across this novel by happy accident. It was a joy to listen to. Alex has created a rich world with relatable characters and a deep back story that serves to flavor, rather than overwhelm his tale: secret organization recruits callow youth to save world. Along the way he encounters: souls trapped in immortal automatons; fractured alchemy; shape-shifters; unkillable assassins; genetic ancestor possession; mechanical magic run amok and hyper-intelligent, pan-dimensional, brain-sucking arachnids. It’s a fast-paced, rollicking ride; so grab your gat & fedora, hop on the sideboards and let’s go! I highly recommend that you reserve the time to give this a listen. You won’t be sorry that you did. I owe Nathan Shumate an apology. 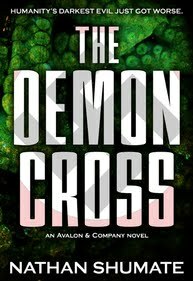 He was kind enough to give me an advance copy of the first of his Avalon & Company novels, The Demon Cross. Naturally, I dropped the ball. So, one of the inaugural posts of this blog’s relaunch will attempt to rectify that oversight. Nathan popped up on my radar at his Pulp of the Day site. I consider myself a dilettante of the highest caliber when it comes to things pulp-ish and noir; which means I loved it! Every day, he gives us one cover from an old pulp magazine or novel and invites us to come up with captions. There’s even a contest. It’s a lot of fun! You may be wondering what this has to do with his novel. Patience, I’m getting there. I read The Demon Cross in one evening. I hadn’t planned on completing it that fast, I just found I couldn’t put it down. It was a short and quick; novella length and just enough to whet my appetite. Was it tautly written? Yes. Was it fast-paced? You bet! Was it a fun read? Absolutely! Nazis, demons, lost books of power! So, what was the problem? Welcome to the relaunch of “A Dark & Stormy Night”. It was time to give the place a makeover. It’s been over a year since I posted an entry, so I figured I’d better repurpose the page or return the storage so someone else could make better use of it. I’m going to be adding bits and pieces as I go along in addition to (at least) weekly posts. A buddy of mine got to give me an “I told you so” after my initial effort petered out. I think that was in large part due to the lack of anything remotely resembling a plan. To prevent him from being able to snicker up his sleeve at me again, I’m going to try something a little bit different. I’ve had a project languishing in the weeds for about two years now. It’s been a challenge trying to find motivation, inspiration and plain old perspiration to complete the work. I think I’ve found my muse or rather, a helpful convergence of things that have rekindled and sparked my interest.